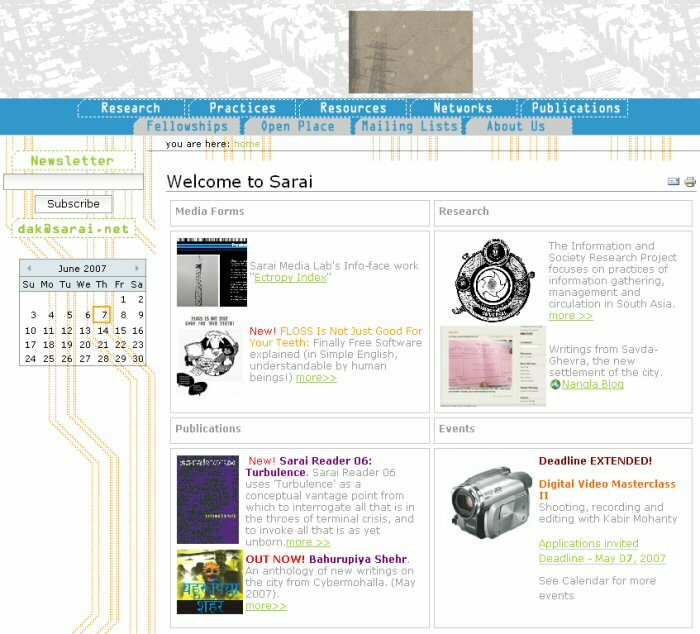 In 2000, Sarai, the New Media Initiative of the Centre for the Study of Developing Societies (CSDS), set up a public access space for the research and practice of digital media in Delhi, one of the first of its kind in the developing world. The Sarai program includes a digital archive of urban culture, a network of public terminals with a specially designed interface, and a media lab, which provides a technological context for collaborations and creations by artists and other involved individuals. The Daniel Langlois Foundation supported the Media Lab component of the Sarai initiative. Its contribution was directed toward acquiring hardware and software and creating research fellowships. The Centre for the Study of Developing Societies, founded in 1964, is one of India's best-known independent research institutes. Bringing together some of South Asia's most distinguished thinkers and writers, the CSDS has played an important part in shaping the intellectual and creative map of this part of the world. Sarai, the New Media Initiative, is a program of the CSDS dedicated to exploring new technologies in South Asia. Acting outside the commercial pressures of the art market, Sarai's Media Lab has been working and experimenting to creatively engage with many of the questions, thoughts and ideas raised by Sarai research. The Sarai Media Lab provides new modes of dissemination through art shows, CDs, books, audio platforms, and the like. Since initiating the Media Lab, the organisers, including the RAQS Media Collective and other Indian artists, theorists and programmers, have stimulated much activity around the centre. Sarai founders have arranged workshops, produced a reader, forged international contacts and partnerships, held an official opening, and organised lectures by leading new media theorists such as Eric Kluitenberg, Geert Lovink and Amanda McDonald Crowley. From the beginning, organisers have wanted to make the new media initiative pertinent to Indian artists, programmers, researchers and designers. To do so, they have had to thoroughly investigate the history of Indian artistic practices, such as woodcutting and calendar art, and identify how to integrate these practices into an Indian new media initiative. One result of this research is the Sarai Web site. A portal for discussing and disseminating vital information on new media technologies and a space to showcase works and projects produced at Sarai, the Web site is technologically advanced in design, rich in content and accessible to a large international public (a). The Sarai team is actively pursuing future projects while disseminating current projects throughout the Indian community and the international Web and new media art communities thanks to a mailing and discussion list (the Sarai-Reader-List) and the Web site. In addition, the team is pursuing collaborative works showcasing Indian perspectives, such as Oxygen, a project delving into immersive, interactive environments while referencing Indian classical dance. This project was created by Monica Narula from the RAQS collective along with two artists from Australia, Sarah Neville and Mari Velonaki. Sarai has also developed a project called the Sarai Interface Zone, an initiative supported in 2001 by the Daniel Langlois Foundation. Acting as a physical meeting place in Delhi, the Sarai Interface Zone is closely linked to the activities of Sarai's outreach projects and acts as a dynamic hub for the exhibition, online dissemination and pedagogy of new media culture.